CBN 101 Guide: How cannabinol is produced, CBN's effects and uses, and the differences between CBN, CBD, and THC. While THC and CBD are present in marijuana in higher concentrations than its other compounds, researchers have begun to take more notice of minor cannabinoids like CBN (cannabinol). Even though CBN isn’t present in high percentages, it plays a large part in the marijuana puzzle. Even though CBN (cannabinol) is a minor cannabinoid, it plays an important role in the way marijuana works. CBN/cannabinol is a cannabinoid, which means it’s one of the active ingredients in marijuana. These are the compounds that make marijuana behave the way it does inside the brain and body. CBN is a minor cannabinoid, which means it’s not initially present in marijuana in high concentrations the way THC and CBD usually are. The way marijuana creates CBN, however, makes this minor player truly stand out from all the rest. Raw marijuana flowers and leaves carry within them a wide range of cannabinoids in their acidic forms. Most strains contain significant amounts of THCA (tetrahydrocannabinolic acid), the precursor to THC, as well as CBDA (cannabidiolic acid), the precursor to CBD. There will also be low amounts of other cannabinoids such as CBCA and CBGA. These cannabinoids turn into their better-known forms (THC, CBD, and so on) once they’re heated; this is a process known as decarboxylation. Fresh marijuana typically contains very little CBNA or CBN because this cannabinoid begins to appear as the plant material ages. If decarboxylated marijuana isn’t consumed, over time, the THC in it begins to turn into CBN. When undecarboxylated marijuana ages, the THCA inside of it converts to CBNA. This process happens even faster if cannabis is exposed to light and air. This is why it’s recommended to store cannabis in airtight containers away from UV light. What does CBN do once the transformation from THC occurs? The biggest difference between these two cannabinoids is where they fall on the psychoactive spectrum. 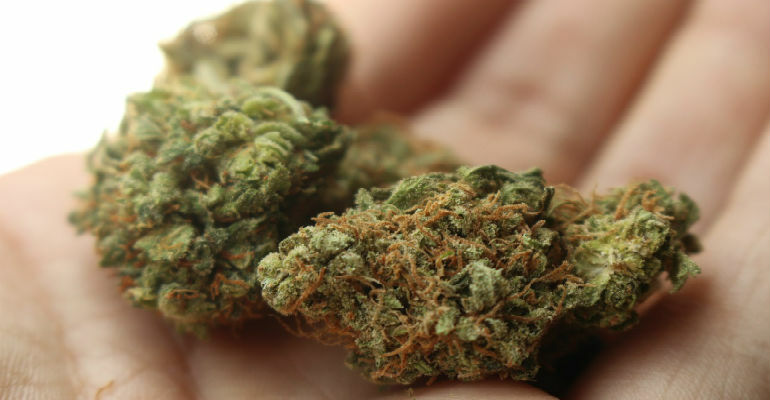 THC creates a euphoric, psychoactive high that’s marijuana’s most well-known side effect. CBN is barely psychoactive (and can only cause a high if ingested in large doses). While CBN doesn’t get people particularly high, it can make them sleepy. In fact, it’s known as the cannabinoid with the greatest sedative properties. Consuming 5 mg of CBN is the equivalent of taking 10 mg of Valium – but with only 10% of Valium’s psychoactive effects. CBN/THC do share some similarities, however: both are excellent at killing pain, as well as reducing intra-ocular pressure in glaucoma patients. This spurred scientists to research various CBN effects to discover the medical potential of this cannabinoid. For recreational users, CBN-filled, stale marijuana is a negative. For researchers, however, CBN is proving to have some excellent medical uses when tested in the lab. Because its chemical composition is very similar to THC, it shares some of THC’s properties (killing pain, for example), but CBN’s differences make it useful in other ways, as well. As discussed above, cannabinol has made the most waves due to its particularly powerful sedative effects. It calms in a similar fashion to Valium but has very few its psychoactive effects, meaning that it can quell anxiety without leaving people feeling “spaced out” or unable to function. Many indica strains of marijuana have higher amounts of CBN (which may somewhat contribute to their sedative effects). However, these amounts are still in such small concentrations that the direct effect from CBN is still small unless the cannabinoid is concentrated (as it is when scientists use it in a lab setting). Over the years, researchers have studied cannabinol and other cannabinoids as potentially effective anti-inflammatory drugs. CBN in particular works on the the pain-sensing TRPV2 receptor, but scientists believe it may also work on the CB2 receptor (which also transmits pain). With strains of bacteria becoming increasingly resistant to antibiotics, doctors have been researching alternative ways to kill these dangerous organisms. Cannabinoids such as cannabinol are showing real promise as treatment for antibiotic-resistant strains of bacteria. In one study, THC, CBD, CBN, and other cannabinoids were shown effective at killing antibiotic-resistant MRSA strains of bacteria. Like THC, CBN has been shown effective at reducing intra-ocular pressure in glaucoma patients. While it worked moderately well at reducing pressure after one dose, its effectiveness increased after repeated doses. Researchers did note that CBN caused ocular toxicity, however. THC also causes this problem, which is why many doctors advise their patients against using marijuana as a treatment for glaucoma – especially in the early stages of the disease. Psoriasis is a painful condition that involves the overgeneration of skin cells (keratinocytes) and intense inflammation. Already proven to be an effective anti-inflammatory, CBN has also been studied for its ability to slow the overgrowth of skin cells at the affected site, making it an all-around good treatment for conditions like psoriasis. Scientists are also looking into cannabinol as a way to speed up the healing of bone fractures. CBN is showing the potential to be able to stimulate bone tissue growth; it does this by causing an indirect recruitment of mesencyzal stem cells from the surrounding bone marrow. These cells have the capability of turning into bone, as well as other tissue. While this doesn’t mean that doctors will be handing out marijuana joints as they put casts on bone fracture patients, it does show that concentrated CBN is a potentially helpful fracture treatment. The question is how to translate these findings into real-world use. For now, scientists simply know that the CBN in cannabis has great potential…they just have to discover how to harness it. It’s easy to get CBD and CBN confused, as their names sound alike, neither one creates a high like THC, and CBD/CBN both have medical benefits. To fully understand what sets these cannabinoids apart, it helps to compare and contrast them. How are CBD and CBN similar? Both are active ingredients in marijuana (they’re cannabinoids). Neither one creates a high like THC. Both are useful for medical purposes. How are CBD and CBN different? Marijuana contains CBD from the start; CBN only appears after THC oxidation. In concentrated amounts, CBN is very sedating. More scientific research has been focused on CBD than on CBN. CBD is widely available for purchase in concentrated forms; CBN is not. Although THC and CBD have stolen much of the thunder in terms of media focus and scientific research, the tide is beginning to shift and other cannabinoids are starting to receive more attention. Scientists are beginning to question whether many of the therapeutic effects of marijuana may be boosted by its minor cannabinoids. They’re also beginning to pull out some of those cannabinoids (like CBN) to see how they might be used individually. Although the medical world is a long way from prescribing cannabinol-based treatments for diseases and ailments, the research conducted on CBN (cannabinol) so far has been promising. With time, it will provide a better understanding of how marijuana behaves as a whole, as well as how its individual parts power this mysterious and potent plant. Scientists have much more to learn about the potential of cannabinoids like CBN.